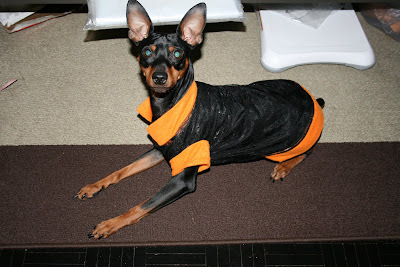 love, ink: Halloween Doggies on Bloggies! Thanks for stopping by! Are you getting ready to greet all the ghosts and goblins tonight?! I remember as a kid, I had a cabbage patch doll. Actually, I had a "knock off" cabby & it was a short haired boy. I wanted a girl doll so bad, I used to pretend she was a girl with short hair. I dressed "her" up in dresses & girly clothes. Each halloween, I sat her on the window sill before I went out trick or treating & dressed her as The Paper Bag Princess. I guess, that's a good indication of my future paper crafting fetish! Now, I have a living breathing little dog, which, funny enough, isn't much bigger than my knock off cabbage patch doll, to torture on Halloween. 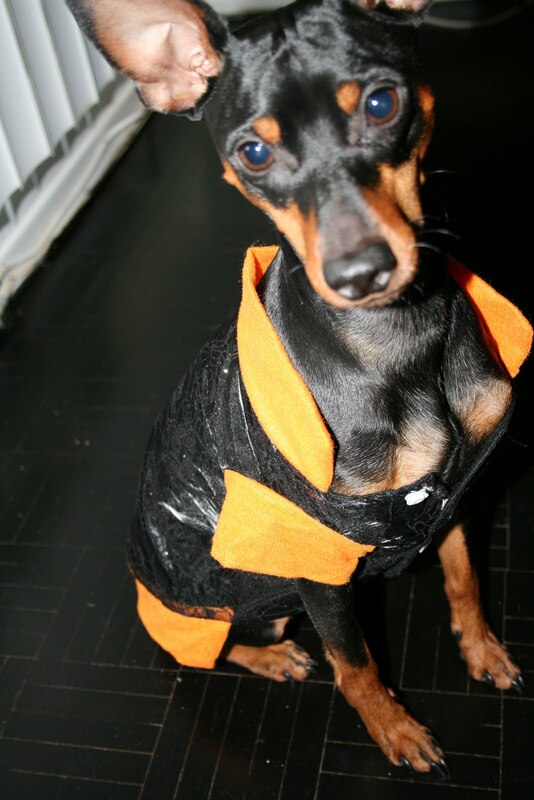 I got Rockstar a little Halloween outfit, which is really difficult to take pictures of because its mainly black with glittery spider web designs all over. I got matching booties, which he just wants to chew! We had them on for a few short seconds and just after I clicked the above photo, I saw through my camera lens one orange bootie flying at my lens! I wish I caught that moment because it had Mike & I in stitches! You can kind of make out the sparkles in this photo. He sat and posed for us!! 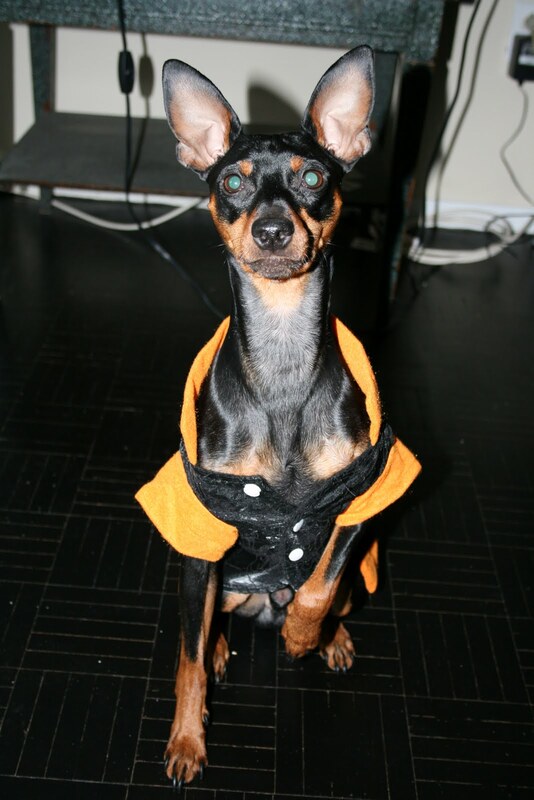 And finally, Rockstar's famous pose, with the one paw up ~ ready to shake your hand for a treat! Thanks for stopping by today! And head on over to the other Doggies on Bloggies blogs for some more halloween fun!! HAPPY HALLOWEEN & KIDDIES, STAY SAFE! Rockstar is looking Fly like a G6!! Omgosh, I could just scoop him up and snuggle! He's super adorable in his shiny coat and lil booties! Glad you got a least one quick pick before he chewed those off, lol! Oh, that Rockstar is a cutie!! 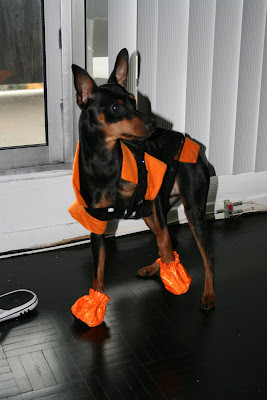 His costume is great, Karen, and those booties are too stinkin' cute! Apparently Rockstar doesn't think too much of them, though! That's hilarious that you got the shot of him leaving those babies behind! I would love to see him walk in those boots. I bet he'd be doing some high steppin'! LOL!! Thanks so much for sharing, Karen. This was fun, and soooo special!! Have a wonderful, safe and Happy Halloween! Super cute!!! 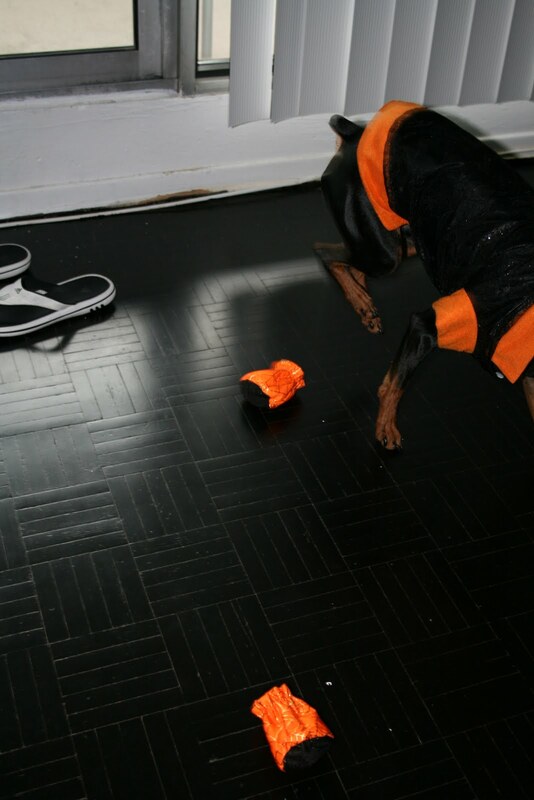 I love that you have photos of your doggie up for halloween. Thank you for sharing. I told Catherine I have some dogs on my blog from our annual Howl-o-ween party (if you want to see.). Hope you all had a great howl-o-ween!!!! I could have sworn I hopped & left comment love. Good grief! Hey Sweets! I've been slooooooowly making my around to everyone, so sorry for the delay. Dude, all I have to say is that Rockstar IS a TOTAL ROCKSTAR!! His little outfit is awesome and the pics are hilarious! Love the booties too. LOL!! wow!!! Great stills. He is looking handsome and cute. His dress is very cute funny. This made me to laugh. This boots color is nice. Thanks for this great fun.